The C&H Adventure Game has a name! 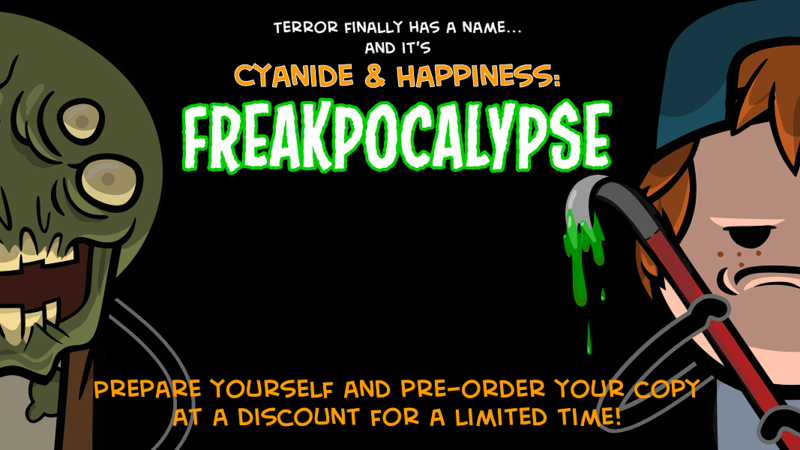 The Cyanide & Happiness Adventure Game is now officially called Cyanide & Happiness: Freakpocalypse! Terror! Doom! Freaks! We'll have at least one of those three things in the game, IF NOT ALL THREE WHO KNOWS?!? If you missed the Kickstarter OR want to pay with paypal, you can still pre-order the game at a discount right here! Right where? Thanks so much to our Kickstarter backers for making this Freakpocalypse a reality!